The coalition said it would be collecting donations in Washington State in order to fight Initiative 1639. That initiative would ban adults under the age of 21 from owning semiautomatic rifles, require those who wish to purchase a handgun to sign a waiver allowing police to access their private medical records, mandate a 10-day waiting period for all semiautomatic rifle purchases, and institute a host of other gun-control measures. The NRA said they believed teaming with other groups was the best way to fight the proposal. "Washington gun owners deserve a coalition dedicated to defending their freedoms, and the NRA is ready to lead the charge," Chris Cox, executive director of the NRA's Institute for Legislative Action, said. "The six million members of the NRA enthusiastically welcome the Citizens Committee For The Right To Keep And Bear Arms and the Washington Arms Collectors to this fight." The NRA had previously partnered with the Second Amendment Foundation to keep the initiative off the ballot because it claimed the petition its supporters had circulated violated state law. A Washington State judge initially sided with the gun-rights groups and ordered the initiative thrown out. But the state's supreme court reversed the decision—the initiative is now assured a spot on the November ballot. 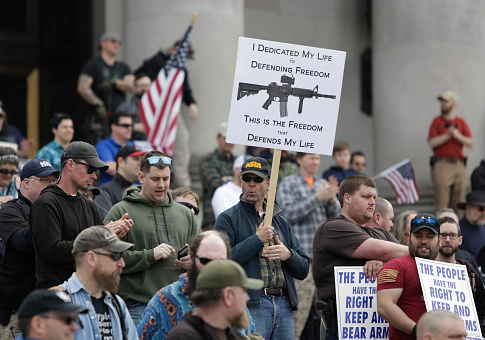 The Citizens Committee for the Right to Keep and Bear Arms said gun-rights proponents need to stop the gun-control effort in Washington State or risk seeing similar measures enacted in other states as well. "We all recognize that I-1639 is a hodgepodge of gun-control schemes, and we're united in the effort to prevent it from passing and turning law-abiding citizens into criminals," Alan Gottlieb, the group's chairman, said. "Gun prohibition lobbying groups based in New York and Seattle are using Washington State as a test tube for their insidious gun-control crusade. We're going to stop this nonsense before it spreads like a cancer to other states." Bill Burris, president of the Washington Arms Collectors, said the initiative is an attack on the Second Amendment and would not deliver on its promise to make those in Washington safer. "The Washington Arms Collectors joins the NRA, the Citizens Committee for the Right to Keep and Bear Arms, and many others who recognize that I-1639 has no public safety value," he said. "We must all take a stand against this attack on our basic civil rights." Initiative 1639 is scheduled to be voted on Nov. 6, 2018. This entry was posted in Issues and tagged Gun Control, NRA, Washington. Bookmark the permalink.